An evening featuring soloists from the Cairo Celebration Choir (CCC) will take place Sunday, 11 June, at Cairo's Falaki Theatre. The singers will perform opera arias, excerpts from famous oratorios, as well as songs from musicals, pop, rock and jazz repertoire topped with Arabic music delights. 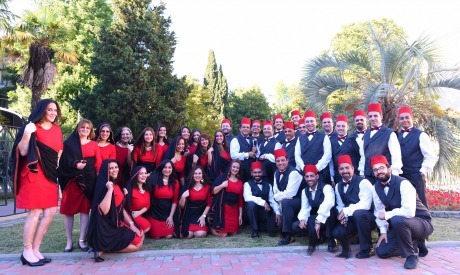 The event, directed by the CCC's founder and conductor Nayer Nagui, aims at shedding light on the "rising stars of the Cairo Celebration Choir," as they are described in promotional material. Founded in 2000 by Nagui, the Cairo Celebration Choir consists of over 100 members. "17 years is the age of Cairo Celebration Choir, years of exposure to different styles of music, to local and international soloists. During this time, the CCC's members felt encouraged to invest in themselves and work on their vocal and musical development. The rising soloists concert is an opportunity to show what they have reached till now," Nagui comments to Ahram Online about the concert. The choir performs works from the Western classical music world, Arabic compositions and joins the Cairo Opera House's Christmas concert on an annual basis. The choir has a few international appearances under its belt, in Morocco and France, among other tour events. In 2012, the choir participated in the Czech Republic's Prague Voices 2012 Festival, winning the Silver Level Diploma. In 2016, Aghani Bel Arabi took the Silver Diploma in the category of folklore with accompaniment at the 9th World Choir Games — an international event held in Sochi, Russia.